The BSD domain is an about 60-residue long domain named after the BTF2-like transcription factors, Synapse-associated proteins and DOS2-like proteins in which it is found. Additionally, it is also found in several hypothetical proteins. The BSD domain occurs in one or two copies in a variety of species ranging from primal protozoan to human. It can be found associated with other domains such as the BTB domain or the U-box in multidomain proteins. The function of the BSD domain is unknown [(PUBMED:11943536)]. Secondary structure prediction indicates the presence of three predicted alpha helices, which probably form a three-helical bundle in small domains. The third predicted helix contains neighbouring phenylalanine and tryptophan residues - less common amino acids that are invariant in all the BSD domains identified and that are the most striking sequence features of the domain [(PUBMED:11943536)]. 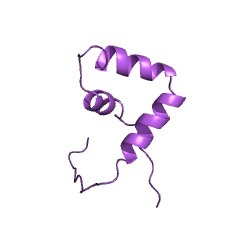 Mammalian TFIIH basal transcription factor complex p62 subunit (GTF2H1). Yeast RNA polymerase II transcription factor B 73 kDa subunit (TFB1), the homologue of BTF2. Yeast DOS2 protein. It is involved in single-copy DNA replication and ubiquitination. Various Arabidopsis thaliana (Mouse-ear cress) hypothetical proteins. There are 5814 BSD domains in 4467 proteins in SMART's nrdb database. Taxonomic distribution of proteins containing BSD domain. This tree includes only several representative species. The complete taxonomic breakdown of all proteins with BSD domain is also avaliable. Click on the protein counts, or double click on taxonomic names to display all proteins containing BSD domain in the selected taxonomic class. This article describes a novel domain, BSD, that is present in basal transcription factors, synapse-associated proteins and several hypothetical proteins. It occurs in a variety of species ranging from primal protozoan to human. 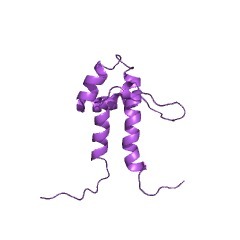 The BSD domain is characterized by three predicted alpha helices, which probably form a three-helical bundle, as well as by conserved tryptophan and phenylalanine residues, located at the C terminus of the domain. This information is based on mapping of SMART genomic protein database to KEGG orthologous groups. Percentage points are related to the number of proteins with BSD domain which could be assigned to a KEGG orthologous group, and not all proteins containing BSD domain. Please note that proteins can be included in multiple pathways, ie. the numbers above will not always add up to 100%.